Hey it's an update. By the way thanks Dasmo for posting the article about the true cost of commuting a few weeks ago. That lead me to discover Mr. Money Moustache and I've been devouring that blog from start to finish ever since. Next project: early retirement / financial independence. Amazing how I didn't stumble across this blog before, given that I suspect there are quite a few commenters here that follow this philosophy. I'm particularly interested in how realistic the early retirement concept is in an expensive city like Victoria. Unlike Mr. Money Moustache, our house didn't cost $200,000, we're not retired before having kids (and thus childcare), and most everything is more money in Canada than in the US. However everyone can still use a good punch in the face as far as spending is concerned. Bonus: an entirely new set of spreadsheets to create, and there's nothing like a good spreadsheet to get the adrenaline going. So... how 'bout this heat? An unexpected joy of homeownership came up this summer, twice even. That is scraping egg off stucco that some local teenagers tossed at the house. Or maybe it was info reminding me to put another damn post up before we hit 500 comments. Well not much has changed in September, but more and more the market seems to be stabilizing. Is it a plateau? Is it a rebound? Is there a dead cat involved? Although we hardly fell fast enough to bounce. Time to update the spreadsheet and see if any particular graph looks interesting enough to post. Since the market peak in 2010 we had steadily worsening conditions for three whole years. 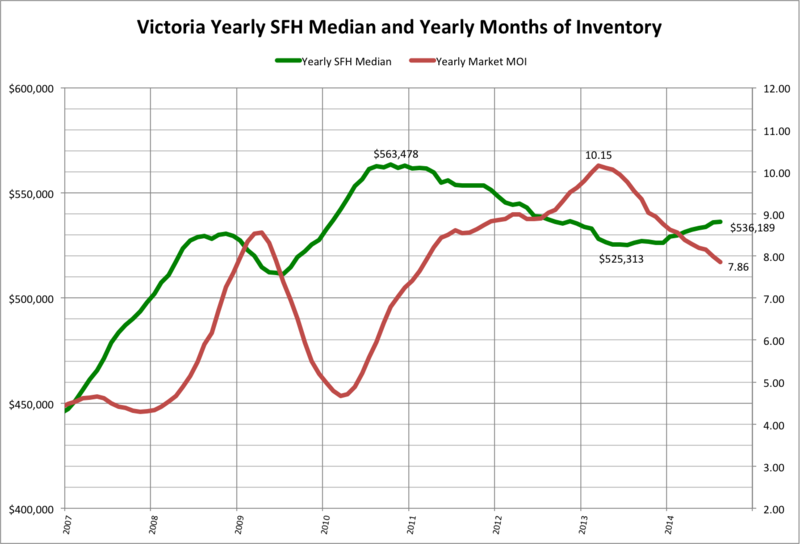 Every month the inventory grew and sales flagged. But since mid 2013 there has been a reversal that has been remarkably consistent. MOI has been dropping for over a year now while prices slowly creep up. Will this turn around without more government intervention? Or maybe the 112,000 lost private sector jobs in August will temper the trend all on its own.